The Downtown Farmers Market turns 21 this year, so when market manager Kim Angeli-Selin says, “Fermentation is hot right now,” one might think she’s talking about sipping some bubbly to celebrate. But she’s actually talking about one food trend she’s seen while looking through the more than 400 applicants for the 2013 summer market. Bubbles can be purchased at the market in kombucha varietals like lemon ginger and mixed berry, produced locally by Mamachari Kombucha. And there is a bevy of other new products to get excited about. “We get a lot more applications than we have spaces. And we don’t have a lot of vendor turnover at our markets,” Angeli-Selin says of the 200 spaces for growers and packaged-goods vendors—not including the arts market. That makes it all the more exciting to see who’s new each year. The goal of vendor Rickenbach Ranch, a steelhead-trout farm, is to connect to the public and explain its farming practices. “It’s a great opportunity to test-market and get direct feedback when you’re building something,” Angeli-Selin says. As far as new growers, First Frost Farm, from Cache Valley, will sell certified-organic garlic and shallots, along with seasonal greens. Prepared-foods vendors include Salty Noodle Company, which will offer healthy and funky flavors of freshly made noodles, like whole-wheat linguine and rosemary & cracked pepper fettuccine. Sugar House Libations will sell a variety of mixers that feature natural fruits and beet sugar, and it’s pretty obvious what Wilson’s Wicked Mustard offers. The Bagel Project involves New York City transplants who began selling their delicious wheels of boiled dough at this year’s inaugural monthly winter markets. 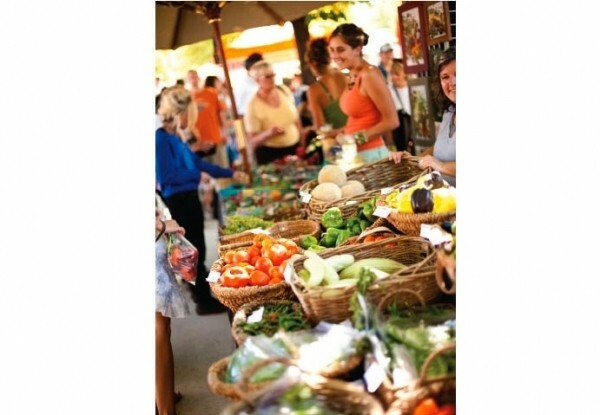 Due to demand indicated in customer surveys, the Downtown Farmers Market will extend its hours to 2 p.m. on Saturdays. Saturdays mornings, 8 a.m.-2 p.m.